Everyday Spencer and I wait in line for Nate to get out of school, which is about twenty five minutes. Some days we will tackle his homework while we wait, other days he goes outside and will play with some other kids. Yesterday, he whipped out a sheet of paper and said, "we are playing tic tac toe." Alrighty then, I had been told. I won a round, then he won, then we went a few rounds with no wins, that's alright. So then he told me we had to come up with a different design not the typical x & o. 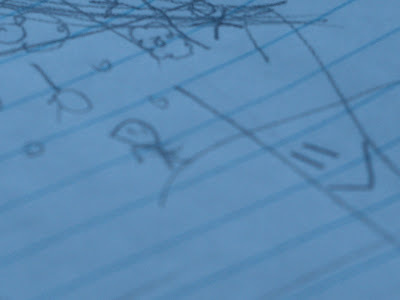 If you look at the picture you will notice a first round with flowers and a stick person but if you look closer it is what he drew in our next round that gave me a chuckle. If you see the smile face (mine) you also notice the stick figure with this thing hanging down. He drew a stick figure with a disco ball and the sparkles that shine off the ball! Honestly, not your average game of tic tac toe. BTW- he won that round.